There are several reasons why you may not be able to see the Edit in Browser command. You don’t have a license. Creating and editing a diagram in Visio Online requires a license to edit. For more information, contact your Office 365 admin. You bought a license, but still can't see the Edit in Browser command. Enabling the Edit in Browser command may take up to 30 minutes. If this takes too long, provide feedback to us. At the bottom of the page on the status bar, select Give Feedback. The Edit in Browser command was available to you, but now it’s not. 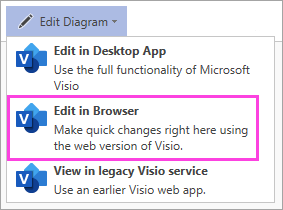 The Visio Online Public Preview has expired. Your Visio Online license trial period has expired. Your Office 365 admin has turned off your Visio Online license. To fix the problem, contact your Office 365 admin to assign a Visio Online license to you.